2017 Arianna Occhipinti, SP68 Rosso, Terre Siciliane, Sicily, Italy. There is always great expectations when I get the latest Occhipinti, and this new SP68 Rosso does not disappoint, it has all the seductive earthy qualities and beautiful fruit expression that Arianna is famous for, it is a pure and charming effort. The hard working and humble Arianna Occhipinti, who made her first (home) vintage at the age of 21, is the epitome of grit and determination, her success is or was almost unimaginable in the region of her birth and gives her an almost mystical aura. Her wines are some of the most sought after in the natural and organic wine world, she has made Frappato an almost household name, pretty amazing for such a young person to have achieved. Arianna was mentored by the icons and legends of natural wines, Elena Pantaleoni of La Stoppa in Emilia-Romagna and Elisabetta Foradori of Alto Adige fame, both heroic women winemakers. That said, her wines are not just natural wines or is their appeal for a limited group, they are fresh, energetic and made with passion and down to earth charm that has won (her) fans from almost every corner of the greater wine world. I personally have found her wine from my little California hometown to the tiny little Swedish village of Vaxjo, across the world away! Considering how little wine she makes and the enthusiasm of her fans, it seems remarkable, such is her following. As Arianna, in almost poetic terms, tells it, everything begun fifteen years ago in the ”Fossa di Lupo” area. In the Vittoria region of southern Sicily, and for Occhipinti, a magical place where the land in the evening becomes reddish and is brushed by the Ibleian winds, it’s here where a little known country road, number 68, hence where her line of SP68 wines gets their name. It’s a county lane like many others, but with a special past, and present for her, its route travels by the small piece of land where she got her start, though fas far back as three thousand years ago it connected Gela to Kamarina, it travelled- as it still does – through the Cerasuolo di Vittoria, becoming the Strada del Vino, this is one of most important winegrowing zones in Sicily, from Caltagirone continuing to Catania and Lentini. Historical for the locals as it was the path of trade and life in this area. There, again as she sees it, squeezed between heaven and earth was the place that gave her the chance to show her talents to the world and she took off like a rocket, and while once regarded as the princess of natural wine, though now she has developed far beyond that niche and limited box, and her wines treasured far and wide, especially her signature “Il Frappato” bottling, though I always adore her SP68 Rosso a mini version of Cerasuolo di Vittoria made from both Frappato and Nero d’Avola. The Occhipinti SP68, an IGT not a DOC, is labeled Terre Siciliane and is a cuvee of 70% Frappato and 30% Nero d’Avola that is grown on the red sand and chalk driven soils over, what Arianna calls, sub Apennine limestone rock. The vines used are at least 15 years old and densely planted and the grapes are all organic, as you’d expect, and the winemaking is careful, pragmatic, precise and minimalist without any chemical intervention in the vineyard or in the cellar. Occhipinti employs a gentile touch with only indigenous yeasts and a about 15 days on the skins with everything done here in concrete, with aging again in cement vat for 8 months before bottling unfined and unfiltered with virtually no added SO2, all to preserve purity, rawness and translucent flavors. This wine, and her others have inspired dozens, hundreds and maybe thousands of winemakers from all over the globe, and her wines can now be found in most chic wine bars and speciality wine merchants, in fact her impact has seen her become a superstar with sommeliers, wine critics, hipster wine influencers and even elite collectors, but it is also remarkable that she has such a following from her peers and the regular everyday wine buyers that continues to surprise the wine community and industry. I must admit to being a big fan and have been for many years, Occhipinti’s wine occupies a special place in my heart, I am always filled with joy and expectation when I drink them, they are not blockbusters, but rather soulful, playful and most of all truthful wines that elicit a sense of seriousness without an over thinking drama about them, there is a feeling of peace and pleasure in them I find wonderfully compelling. The the pale blue/crimson hued 2017 is fresh, showing a hint of reduction and earthy tones at first before opening up to its pretty fruit and spice showing its core Frappato driven character with sweet strawberry, plum, cranberry and unique lingonberry note as well as wild herbs, basil, pepper, anise, saline and brandied cherries. The mouth feel is smooth and easy, its medium weight (like Pinot Noir) is both refreshing and substantial giving a sense of completeness, complex and sensual charm in a lighter framed and racy wine. Air just opens the bouquet further with florals and mineral sensations, and while less sharp than Gamay, it is stylistically similar and can be enjoyed with a slight chill and it will, like Pinot go with lots of cuisine options, enjoy this new SP68 over the next 2 to 3 years, it’s vivid, easy and lovely. 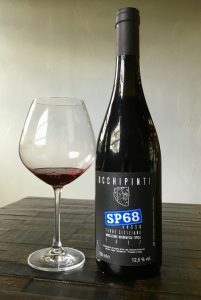 Occhipinti is a star, and her wines a reflection of her place and person, it is hard not to, after sipping her wine, book a flight to Sicily, especially this SP68. This new release is a gateway view to the vintage, which looks to be an impressive one for this part of the island and I look forward to tasting her other bottlings.